Farm visits help consumers connect the dots in agriculture. But are there ways for landowners to help protect themselves from liability if a visitor has an accident on their property? The Agritourism Act, which was passed in 2015, offers limited liability to landowners who open their agricultural land for recreational or educational purposes, regardless of compensation. The statute requires landowners to post specific language warning visitors of potential hazards on the property or to have a waiver signed. 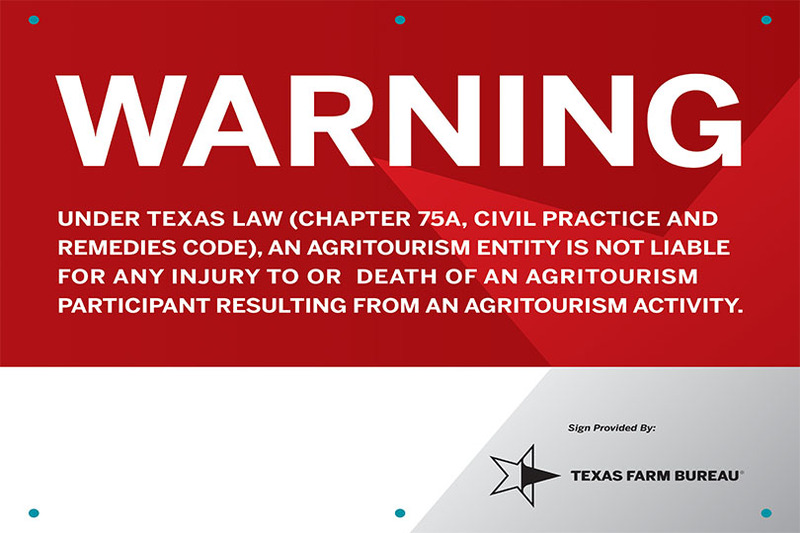 Texas Farm Bureau (TFB) offers agritourism liability signs that meet the language requirements. The Texas Recreational Use Statute also applies to landowners who use their property for recreational purposes if it meets one of the three monetary criteria: a fee is not charged; the fee charged by the landowner is less than 20 times the amount of ad valorem taxes paid by the landowner last year; or the landowner maintains insurance coverage as defined by the statute. Agritourism—the intersection of agriculture and tourism—is a growing trend fueled by consumers. It serves a dual purpose—allowing for farming and ranching practices as well as farm visits. The signs are available for $4. To purchase a sign, complete the order form found online at https://txfb.us/agritourism. For questions, contact Allie Bridges at 254-751-2667 or abridges@txfb.org.